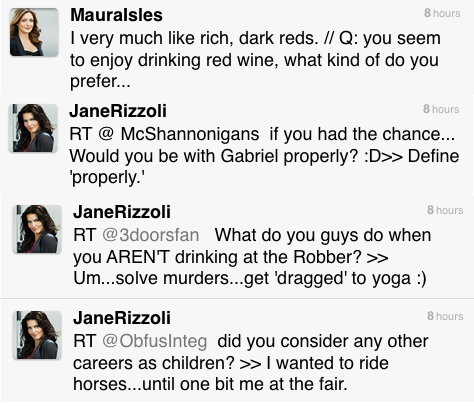 It’s Tuesday morning, which means it’s time for a recap of last night’s Rizzoli & Isles twitter action. There was no 5 minute deleted scene this week, but we did get that Q&A session they promised. For thirty minutes or so, @JaneRizzoli and @MauraIsles answered viewers’ most burning questions. Some of the answers were a little long for Twitter’s 140 character limit, so I screencapped the complete answers for your reading convenience. If you’re wondering what could be even better than a pony or a monkey, it’s an interview with Sasha Alexander at beerwithduncan.com. Enjoy!